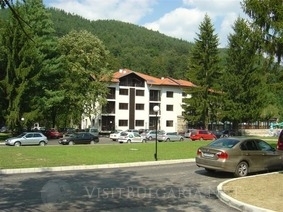 Location: Holiday village “Ostrova” is situated in Beli Osam village, just 4 km away from Troyan and 160 km away from Sofia and 15 km from Beklemeto. The name of the complex is connected to its unique and attractive location – like a small island between 2 rivers – Beli Osam and Razhdivets, at the foot of the Troyan Balkan. The region offers picturesque natural resources of the Central Balkan natural reserve, the fresh and mild climate and healing mineral springs. Accommodation: Ostrova Hotel offers apartments and standard rooms and one mansard apartment. The hotel is a 3-storey building with panoramic view towards the mountain. The rooms are modernly furnished and offer twin beds or a double bed. Some of the rooms offer folding sofa. All rooms offer individual bathroom, terrace, TV, central heating system or AC. Some of the apartments offer fully fitted kitchenette. Wine & dine: Ostrova vacation village offers a wide restaurant with a capacity for 150 guests with a panoramic terrace and beautiful view. The restaurant offers a show-cooking corner, a real attraction for food preparation right in front of you. The lobby bar of the hotel offers great variety of alcohol and fresh drinks. Spa centre: The spa centre will revive your organism ad will hydrate your skin. The complex offers a modern steam bath, sauna and laconium. The swimming pools are the ultimate attraction of the complex. It offers an indoor and an outdoor swimming pools. The outdoor swimming pool offers 2 Jacuzzi. The complex also offers a summer bar, serving snacks and refreshing drinks during the summer.